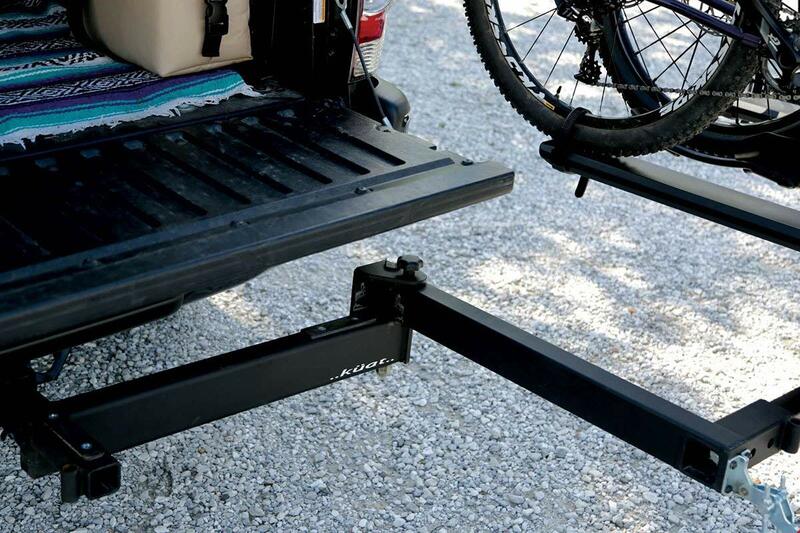 Hitch racks are incredible but one big disadvantage to some is they’re in the way of the hatch or the tailgate. All the gear is out back and a hitch, especially a loaded one blocks the way. Some tilt but only provide limited access. The solution is a swinging hitch rack and it does exactly what it says, swings out of the way. Some are complete racks and some are just adapters that are meant to attach to your existing rack. Mind you that there is one significant weakness to be aware of is the swing mechanism adds flex and leverage to the system. All these bars and hinges add flex and length to a very heavy, loaded hitch rack. So the beefier the swing mechanism, the better. And most are limited to two bike capacity. We’ve had a lot of time with the Backstage Swing Away so we’ll feature it first. 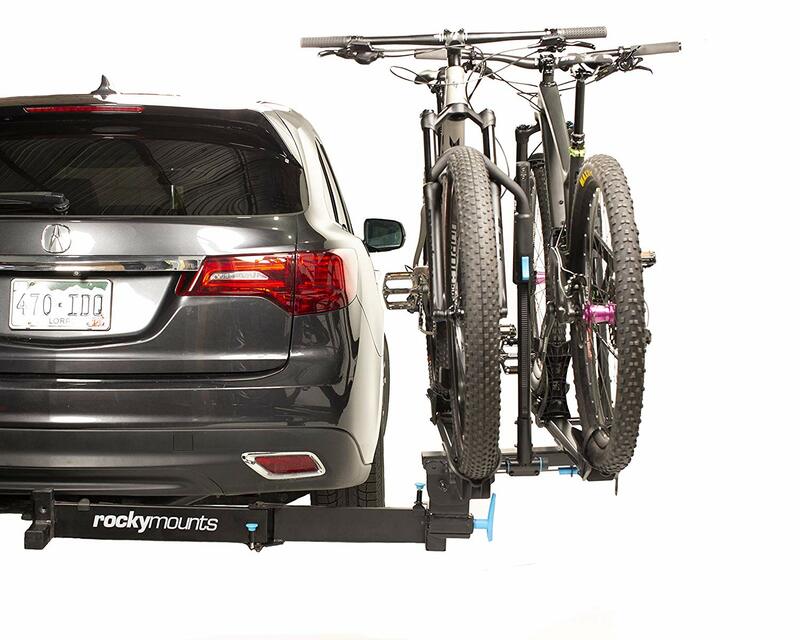 It has the ability to swing away for easy access to the rear of your car, the RockyMounts BackStage Swing Away Platform Hitch Rack is an ideal option for campers, dog owners, and anyone with a fully loaded vehicle. 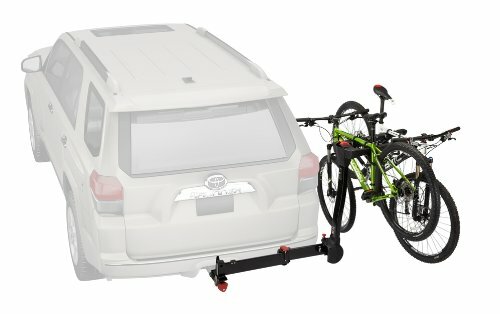 This 2-bike rack swings to the passenger side for uninterrupted access to your gear via a cantilever arm that maxes out at 41-inches for universal vehicle compatibility. RockyMounts equipped it with a handle at the end of the rack for easy use when it’s in either a stowed or folded position, and the folded position only sticks out a foot for a compact design. It’s easy to load and unload with 13-inches of spacing between the bikes, which also keeps them safe from making contact with each other while in transit. Plus, the lightweight Chromoly hitch tube is designed to resist corrosion to provide you with years of reliable use. * Big downside is this hangs bikes off the top tube. So fancy full suspension bikes may need an adapter. * 4 bike carrier swings away with bikes loaded to provide access to vehicle. * Single bolt assembly makes for easy installation and Tool-free SpeedKnob quickly tightens and locks the rack to your car. 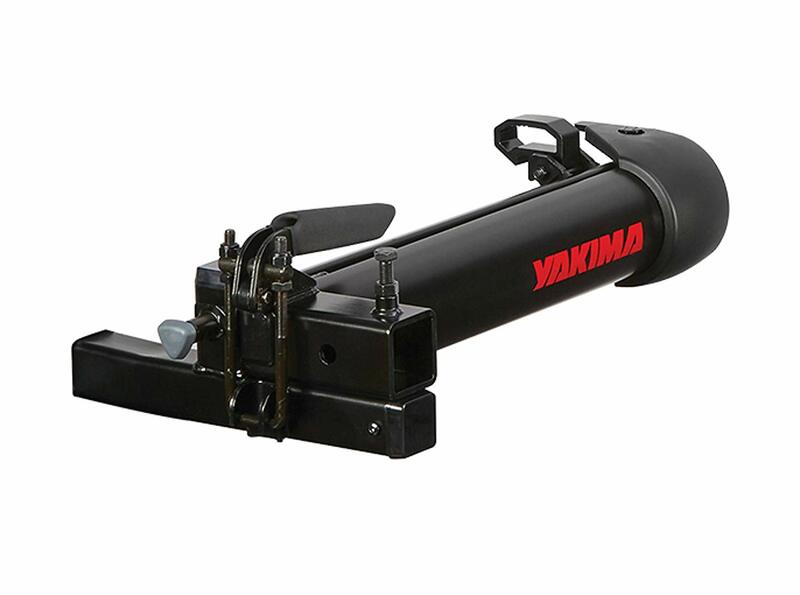 * Yakima Limited Lifetime Warranty. With the Kuat Pivot Swing Away Extension, your back of the vehicle party problems are solved. 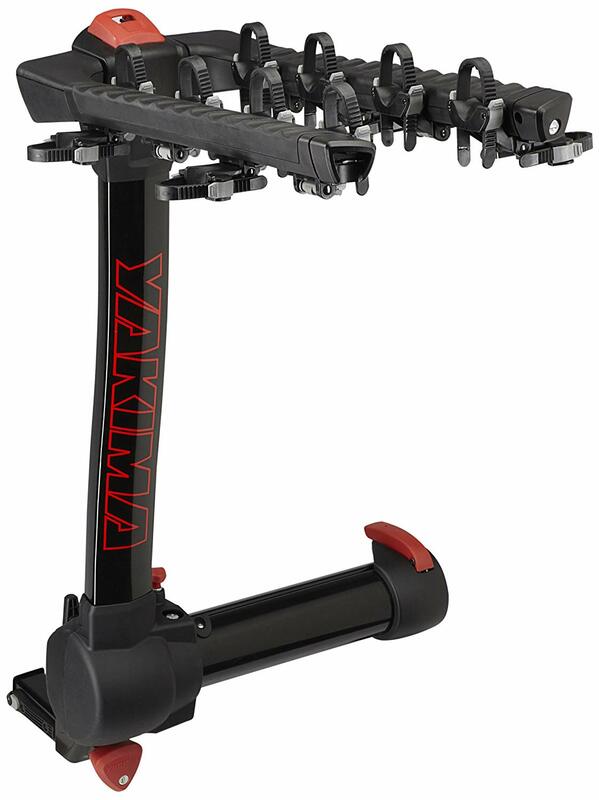 This arm attaches with any 2-inch rack to securely hold your rack with up to 4 bikes. It also swings those bikes out of the way if you need access to gear in the back of your truck, or need to grab an amber ale to toss to your buddy while you enjoy your post-ride brews. 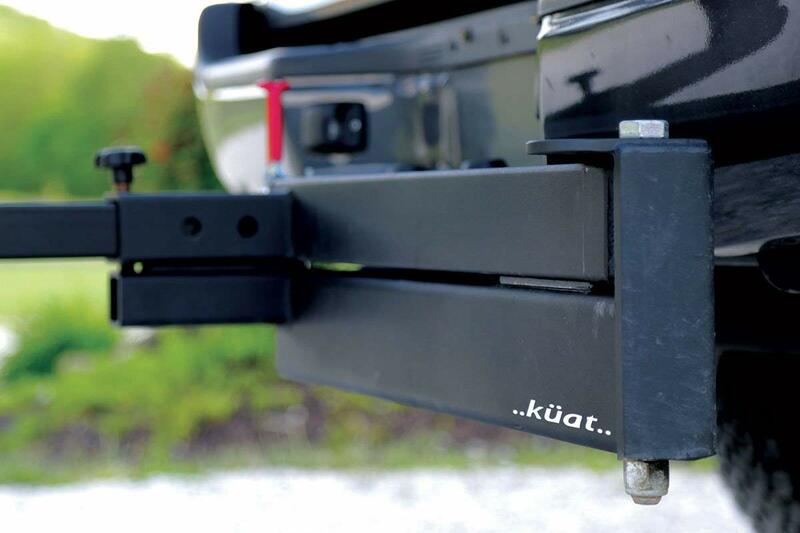 The Kuat Pivot Swing Away Extension is welded to be tough, holding up to 250lb when loaded, and it attaches to your 2-inch hitch receiver while accepting a 2-inch hitch in the back. It swings a full 90-degrees, allowing you to fully open your hatchback or drop down your tailgate for access to gear. A locking anti-rattle hitch pin ensures that the rack stays secure and doesn’t give your bike too much of a shake on the ride to the trailhead. As burly as it needs to be with big levers. This is a burly one and a fine choice for enthusiasts with demanding needs. The 250 lb weight capacity makes it ideal for 3 bikes and rack, maybe a stretch for 4 bikes. The Backswing extension gives your hitch-mount rack the freedom to swing out of the way so you can access your tailgate. 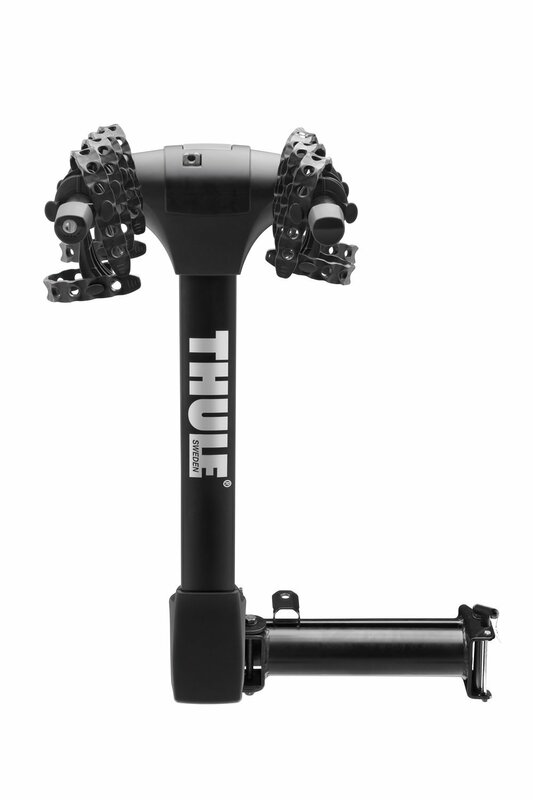 Easy to install, it locks in place while you’re on the road, then unlocks so you can swing your fully-loaded rack a full 90-degrees out of the way to grab your gear, cooler, dog – or just sit and enjoy some post-ride tailgating. Built strong, the Backswing can hold up to 250 lbs, and works with just about any hitch-mount rack using a 2″ receiver. 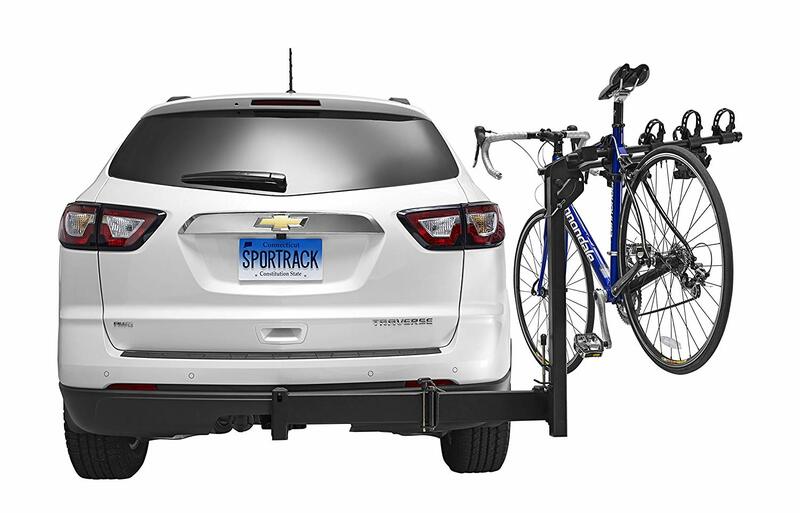 What do you look for in a bike hitch rack and what are your favorite brands and models? Let us know in the comments section below.